Just had a play with tinkercad and made this 360 cooler,Seems to work well. That looks great. Does it blow all around the nozzle? I looked at that and thought that it looked very heavy to put on the effector... then I realised that it's mostly empty space... I just worry about the fan flapping around on the top when the effector's changing direction rapidly. However - in reality - I'm sure there's no problem! Edited 1 time(s). Last edit at 05/02/2015 11:43AM by David J. Which slicer are you using? I find that I get a lot more stringing with Slic3r than with Cura - in fact, I rarely get stringing with Cura. I'm sure that there are settings that can be changed in both slicers - but when you have one that gives nice results, and one that doesn't - guess which gets used! Im using cura,Could you send me your settings. Probably not much use to you at the moment as they're all for my Prusa i3 - my Cherry Pi is being upgraded to a Duet board just now. However, have you selected the "minimize crossing perimeters" checkbox in the "Extrusion" setup? And also "Enable retraction"? The first one certainly had an effect on stringing when I was playing around, although it did make the job time a bit longer. Hi group, we bought a cherry pi back in september well, we're having our first major issue, I was changing the PLA over and upon starting a print. it seems the Z axis has lost it's placment, it is no longer printing on the bed but like 10mms away from this. I have tried a multitude of things, renistalling software, changing computers etc. tried it with repetier and cura, same issue all round. I have enabled retraction but cant find minimize crossing perimeters,Where is it in cura. If I've understood it correctly, It tries to keep the nozzle over the print as far as possible, instead of taking the direct route. If any threads are left behind they will tend to fall onto the plastic already deposited. The downside is that the nozzle has to fly all over the print, thus taking more time. Edited 1 time(s). Last edit at 05/04/2015 03:30PM by David J. Just a thought - I use the Cura plug-in for Repetier-Host. Is that what you're using? The reason I ask is that I've just looked in the stand-alone version of Cura and I couldn't find the 'minimise crossing perimeters' in there. IM just using cura on its own that's why I cant find it. Don't be afraid to go higher than 5mm retraction, despite what the defaults are in most slicers. Bowden setups need more retraction, due to slop in the system. Also, most firmware has acceleration limits that also apply to the extruder. My working settings are 5.5mm retraction @ 100mm/second, with the firmware acceleration adjusted accordingly. Edited 1 time(s). Last edit at 05/05/2015 06:24AM by vreihen. You might also want to try with an older version of Cura. I've noticed some strings appearing in my prints since I moved to V15. Try going to a V14, without changing anything else, and see what happens. If the ball sockets on the effector and carriages weren't great and the balls didn't fit snugly into them what would you expect the printer to do? I have an issue with repeatability in the bed level, it appear to be different every time I home. I don't have any play in the frame, the belts are tight and don't appear to be slipping. When I manually calibrate and then home, come back to the same place the x, y and z tower offsets change. I was thinking that the limit switches might be bad (not repeatable) They are firmly fixed in place, but I'm not convinced the balls fit as snuggly in the sockets as they should. Does anybody think this might cause the issue? Could be. Why don't you get an 8mm ball end mill and gently ream the sockets to ensure a snug fit? I didn't know you could get such things I have just ordered one from eBay. Be VERY gentle with it - they are very sharp and tend to dig into the plastic if you're not careful. If you have a good drill press with tilting table you could them feed it very gently DO NOT HOLD IT BY HAND unless you want to lose some skin or worse. me I think i would get a hand chuck or similar for the job. I held mine by hand - it's a real struggle to stop the mill digging in. I wouldn't put it into any sort of electric drill - hand-held or a drill press - as everything would happen too quickly. If you have a drill with a removable chuck then that would be ideal for manually turning the mill (as Doug said). Take the chuck off, insert the ball mill, GENTLY turn the mill by hand in the hole. Slow, slow, slow is the order of the day. Really, you're only trying to remove the high spots without taking any of the main plastic from the part. And yes - you really risk your skin trying to rotate a brand-new mill by hand! The cutting edges are as sharp as razors. Edited 1 time(s). Last edit at 05/07/2015 12:20PM by David J.
I'm recalibrating my CPIIIs again as parts were printing too small. I've noticed that when I manually step the Z axis by 0.01mm, I have to press the button 12 or 14 times before the carriages move up and when they do they jump up the accumulated amount in one go. Then I have go down a similar amount before they move again. I've also noticed when calibrating, that having got the paper lightly gripped on say the X tower, that if I move to another tower and then go back to X the paper will be either too loose or too tight. Is this normal? The belts are suitably tight and the carriages won't move if I hold the motor pulley stationary, so it's not slop or backlash. I've checked configuration.h and the motors are set for 80 steps/mm and 200 steps per rev, with 16 micro-steps. Could this be caused by having the motor current too low? I have a die tap handle I'm hoping the bit will fit into, I'm hoping that will do the job. I'm looking for somewhere to plug in my E3Dv6 hot-end fan, which should be a continuous 12v at low current. Looking at David's wiring, he has a plug on pins 31 & 35 of the 'motors and extruder loom' header (31=GND, 35=E0 V+) - is this a connector for a fan? It's the connector right next to the extruder motor and X end-stop connectors (click on the picture to enlarge the view). The schematic suggests that it should be V_IN, which in my case will be 12v. If not here, is there anywhere else I can connect to? If there's nowhere convenient on the board then I'll have to create a 12v distribution point from the incoming power wiring. UPDATE: I've just been reading the thread about David's IR Z-probe, and he shows the hot-end fan wired exactly as I described. So - question answered! Edited 3 time(s). Last edit at 05/09/2015 10:41AM by David J. 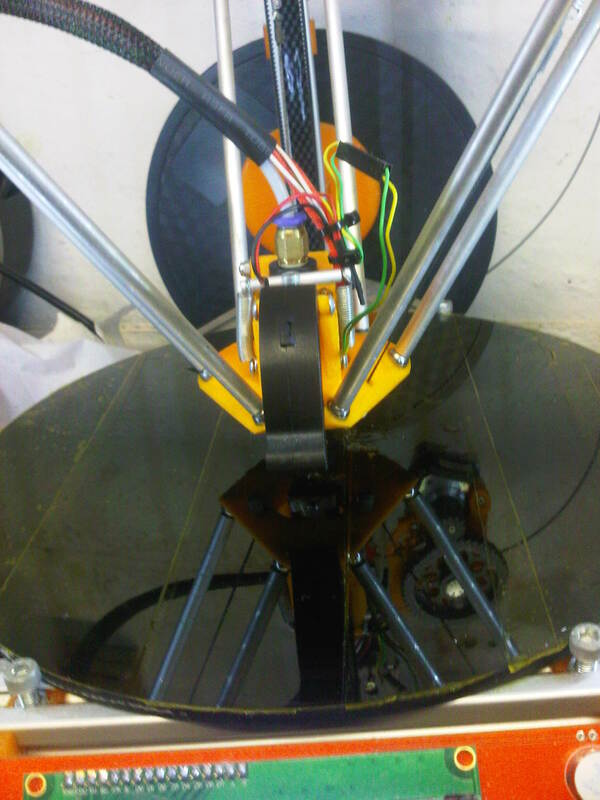 Thanks for the info andy I went back to cura 14 and my stranding has gone. 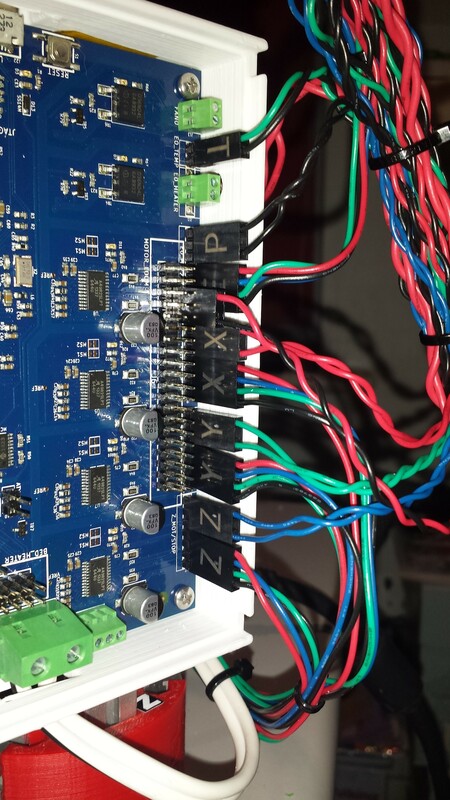 I must say that it's a lot easier to wire up the Duet board in a tidy manner, unlike the old RAMPS board! Basic movements and settings are going well so far.